Bengaluru, 24th August 2018: The 5th edition of the Mulki Sunder Ram Shetty All India Basketball Tournament, organised by Vijaya Bank, saw day two action yesterday at the Beagles Indoor Basketball Stadium, Malleswaram. Vijaya Bank and Income Tax, Chennai posted dominant wins to go 2-0 in Group B. In doing so, both teams are assured of semifinal berths and will face each other later this evening in their final group game. Vijaya Bank, in fact, has posted three digit scores for the second straight time, becoming the only team in the tournament to achieve this feat so far. From Group A (which consists of only three teams), Indian Navy too posted its second straight win and has progressed to the semifinals. The first game of day 2 saw Indian Customs, Pune trying to fight for their first victory of the tournament against the dominant Income Tax team headed by veteran India team point guard Akilan Pari. 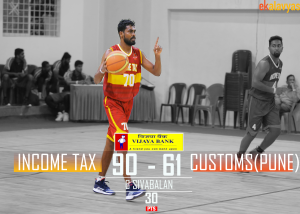 Customs team kept their opponents under check in the first half of the game with the help of former Indian team guard Siddhant Shinde but couldn’t keep up with the mighty Income Tax team in the second half. The 1st quarter started with a flashy behind the back fake from Pari for the opening basket for Income Tax team followed by a sweet up and under post move from Income Tax’s ex international forward K. Ravikumar. As the game progressed, Customs, Pune answered every two pointer by the Income Tax team with a three pointer of their own and kept the game leveled through the first quarter. Income Tax ended the quarter with two quick fastbreak baskets from G Sivabalan giving them a 19-13 lead. Income Tax scored 10 quick points in the first two minutes of the 2nd quarter thanks to some heroic offense from G Sivabalan which increased their lead to double digits. Midway into the quarter former Indian team guard Siddhant Shinde displayed a great shooting performance from midrange and reduced the lead back to 6 points. Ending the first half of the game Akilan Pari showed his expertise with the ball and created some beautiful plays for his teammates to end the quarter leading 48-36. 3rd quarter saw a complete change of momentum for the Income Tax team as their guard G Sivabalan started to heat up from beyond the three point line and drained three long distance shots on consecutive possessions. Meanwhile Customs were not able to convert their attempts from the three point line which they were heavily reliant on throughout the game. Income Tax started the final quarter with a huge lead of 25 points which they maintained towards the end of the game thanks to major contribution from S. Ramkumar in the fourth quarter. Customs could not overcome the deficit in the last quarter and lost the game 61-90. The second game of the day saw hosts Vijaya Bank take on the young Telangana State team. Telangana made some noise in the first half but Vijaya Bank’s star guard Anil Kumar continued his stellar performance to make this a no contest. The 1st quarter saw a great start for the Telangana team as Visu Palani gave them an early lead. But Telangana missed many easy baskets in transition later in the quarter because of which Vijaya Bank took a 6 point lead. The start of 2nd quarter again saw Telangana trying to get back into the game with some quick points but hosts Vijaya Bank came back with some solid defense and good playmaking by their point guard Rajesh Uppar and consecutive baskets by forward S Karthik. Anil Kumar continued his good form on both ends of the floor as he converted his own steels on the other end and finishing the half leading 65-33. Vijaya Bank started the 3rd quarter resting all their starters as they were sitting on a comfortable 32 point lead but the Telangana state team still could not overcome the deficit created in the first half. Meanwhile Clinton for Vijaya Bank kept their scoring streak alive and extended the lead even further and Nagaraj N. finished the game strong for Vijaya Bank with a slam dunk taking their score to triple digits. The final game of day 2 was a matchup between Group A teams Indian Navy (Lonavala) and the Karnataka State team. Indian Navy already had one victory under its belt and they amazed the crowds with their athleticism and speed whereas the Karnataka team who were playing the first game of the tournament looked very determined and had great support from the crowd as well. The game tipped off with some high energy action from both the teams. Karnataka team, which had a comparatively younger core, matched up to the speed of their opponents’ game and kept the scores leveled throughout the first and second quarter. The duo of Vivek Goti and Indian team guard Mahipal Singh facilitated majority of the offense for the Navy team but they did not seem to have a defensive plan to stop the explosive guard Abhishek from Karnataka as he single handedly kept the scoring alive for his team and finished the first half leading 33-32. The second half of the game saw the momentum shift completely towards Indian Navy as they had an amazing 10-0 run to start the 3rd quarter. The Karnataka team struggled a lot offensively in the 3rd quarter where they were forced to take a lot of difficult shots by the Navy defense which helped Indian Navy take a 26 point lead by the end of the 3rd quarter. 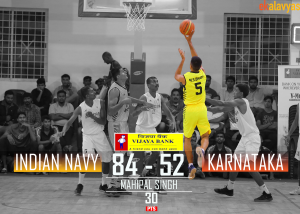 Karnataka started the 4th quarter with a lot of determination to cut the lead short and get back into the game but all their efforts were denied by Navy team guard Gurvinder Singh Billa who came off the bench and took it upon himself to close the game for his team. Billa scored the last 14 points for his team which included four shots from the three point range and thus managed to secure the victory beating Karnataka 84-52.